(Stage 23-35): 17 days, 285 kms pilgrimage (177 miles). North Coast: From Avilés to Santiago (Stages 19 - 33 of 33). Spain is More offers you the unique opportunity to walk this picturesque and exciting route along the Northern Coast of Spain to Santiago de Compostela. This is a tour suggested to travel from Avilés in Asturias to Santiago de Compostela in Galicia – a total of 285 kilometers (177 miles). The time and distance can be shortened or extended depending on your time available. The Camino del Norte from Avilés is a route through a very different and beautiful part of Spain. Here you will not meet many foreign hikers. You'll encounter small fishing villages and the lavish natural surroundings that will give you a unique impression of a different and far more unknown Spain than you probably ever imagined. Avilés is a beautifully located and modern city, that has maintained a cosy and old quarter's atmosphere where you'll find interesting shops, and "sidra, " a source of local pride. This part of the Camino del Norte meanders through some of the pleasantest coastal towns in Spain, all of course, with excellent fish restaurants. The rocky coast hides some of the best and most beaches in Spain, which in the summer are frequently visited by locals. You will find everything from impressive monasteries to one of the world 's most stunning beaches (No. 6 on TripAdvisor's list of the world 's most beautiful beaches in 2015,) all the while, in the usual Spain is More style, staying at lovely hotels along the way, each always featuring a private bathroom and close location to the Camino. Enjoy a different and exciting pilgrimage through Northern Spain, with the sea on your right and the mountains on your left. An experience of a lifetime! On this Pilgrimage hike on you will experience stages 23 to 35 of the 35 Camino del Norte stages to Santiago. ✔ Daily Departures from March to October. ✔ This trip can be combined with other Camino routes. 17 days / 16 nights. In the first stages of this route from Gijon/Aviles there are some ups and downs. A couple of them include a stretch of 2-3 km. After passing this stage the challenge is the valleys with their rivers and lakes. On this stretch the wind plays an important role since it will be rather easy if you have it at your back, but much more difficult if you are facing the wind for this part of the route. The stages are divided by difficulty; the hardest is the shortest stage and the easiest is the longest. In the section "stages you will find more detailed information about each stage, such profile maps of the stages and photos. Service functions are good throughout the length of the route. In the towns or cities where you'll be lodging there are always restuarants and other services, such as banks, supermarkets...etc. Possibility of dividing stages: Yes. See description of the stages. In Ribadeo you will leave the coast behind and you won't see the sea again after this point. The terrain on this stretch is easy; it's not flat, but the ascents are normally short. The stages are complicated to divide, making the route more difficult that it really is. In the section "stages you will find more detailed information about each stage, such profile maps of the stages and photos. Service functions are limited throughout the length of the route, something you will have to take into account before leaving each day. In the towns or cities where you'll be lodging there are always restaurants and other services, such as banks, supermarkets...etc. Possibility of dividing stages: Yes, some. See description of the stages. Arrival to Avilés, normally by train from Madrid, however, we can always tailor the local tranpsort depending on your arrivalpoint in Spain. Avilés is primarily known for its cultural center, which was designed by the famous Brazilian architect Oscar Niemeyer. The city also has a nice old town. A pleasent city to spend the first night to enjoy the old quarler. During this stage and the many days following, you will nearly always be able to enjoy the sea on your right. The rocky coastline is sometimes hard to reach, but wide, long white sandy beaches often open up. Today, the stage ends in one of the most charming fishing villages on the Spanish Northern Coast. A mixed stage, as you follow a bit of the Camino and later some miles along the road. Nevertheless, a stage through forests and often with a beautiful view of the sea. Over 50 meter vertical rock walls separate you and the sea on this stage, often with small, almost pristine beaches in between. The stage is relatively flat and quite easy (if it is not windy) and ends in one of the northern coast’s most-beloved villages, Luarca, which is often among the villages highlighted when magazines and newspapers vote on "Spain's most beautiful village". In many ways similar to yesterday's stage. It is relatively flat with beautiful views, beaches, pine forests and open countryside. 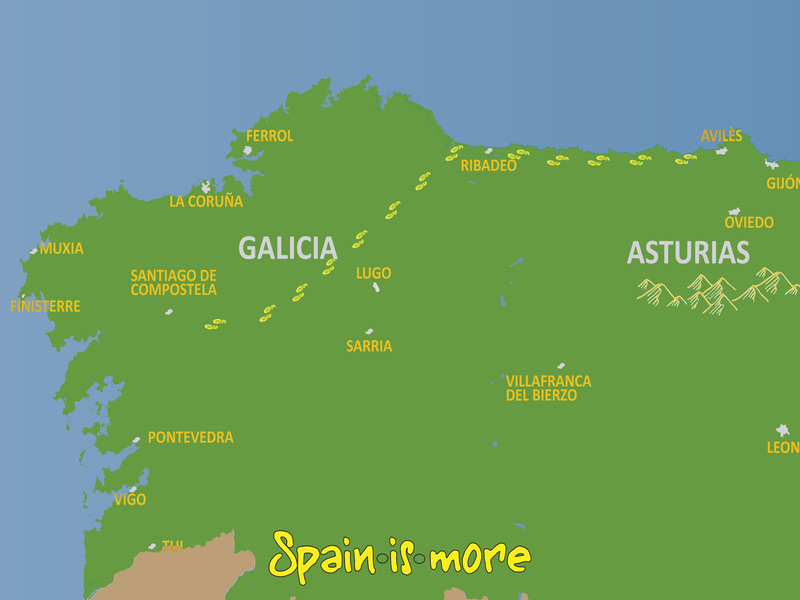 You will be leaving Asturias and saying hello to Galicia. Here, you are very close to one of the world's most beautiful beaches, Playa de las Catedrales (see picture), and the afternoon will include a visit to the beach. The tour includes transportation to and from the beach from the hotel in Ribadeo and some time to see the beach. Playa de las Catedrales is approximately 10 kilometers from Ribadeo. You move away from the many small villages along the coast and into the highlands. The terrain thus becomes hillier and the contour line increases to about 300 meters (1,000 feet). Setting out, you get a last glimpse of the coast before finally saying goodbye to the sea. At the same time, you are moving into a very unknown and rural Spain, where you will see old farming methods and small towns where you would be the only tourist were it not for the Camino. It's an interesting and different part of the Camino starting with this stage. This stage goes through the city of Mondoñedo, which houses one of the northern route's most beautiful cathedrals and thus one of the main monuments along this route. The city and the area are also home to a few interesting monasteries. Galicia is in many ways very different from Asturias, but one of the most visual differences is the many "horreos" that you can find anywhere. These ancient "refrigerators" will constantly remind you that you are in Galicia. An easy stage without significant obstacles, a day for enjoyment and mental relaxation. You will probably stay the night in Vilalba’s beautiful parador hotel. Vilalba is a large town with several good restaurants and is the last larger town before you move into a relatively deserted area. After about 10 kilometers, you will leave the highway that you have been crossing many times over the last couple of days. You will walk into a very rural area with lots of open fields, forests, etc. A stage which in many ways is similar to yesterday's stage, where forests, ponds and fields surround you. The cultural highlight of the day is the monastery in Sobrado. This is the last stage before the northern route integrates with the French route in Arzúa. From here, you are only two stages from your goal in Santiago, and you will meet many pilgrims who want to learn more about Camino del Norte. An exhilarating atmosphere unfolds as your journey's end draws closer. Pilgrims now see and feel their goal, and begin to revel in happiness and relief with the many companions they met along the way. Congratulations, you achieved an admirable goal, so it's time for a number of traditional pilgrimage rituals. First, be sure to get proof of this feat: the last stamp in your pilgrim passport. Along with the rituals, enjoy the End Station of the Pilgrim route, Santiago de Compostela, which offers a veritable cornucopia of attractions and one of the world’s most important cultural centers. This university town exudes charm and has a myriad of cozy streets offering ample opportunity to sample the many local delicacies. The cathedral is surrounded by a historic center which is on UNESCO’s World Heritage Site list, and old town is incomparable. Its monuments stand as true works of art in different architectural styles. 16 nights in a double room - always with private bath/toilet. Transport from Madrid or Bilbao to Avilés. Excursion to Playa de las Catedrales from Ribadeo.